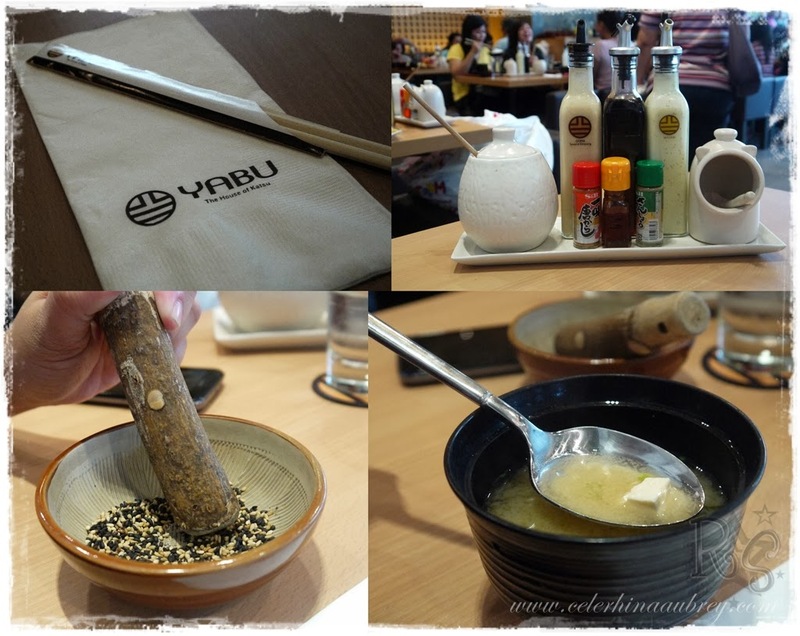 After checking out the Baby Expo at SMX Convention Cemter last December, The Companion, Sissy and I went to try Yabu. I was already starving after more than 3 hours of checking out the booths at the event and was craving for yummy Katsu. I was able to try it a couple of months back with some of my officemates and we all liked it . As usual, the “grinding” kept all of us busy while waiting for the food. Ang galing na idea para hindi ka mabore. Hihihihi.. But since I’m pregnant and already starving, I asked the waiters to serve me a bowl of miso soup right away which they gladly obliged. That’s one thing I really like on Yabu, their superb customer service. Lahat ng waiters super nice. They always give a smile to their customers kahit na mga kagaya namin na mukha ng dugyot that time. Bitbit kasi namin yung playpen na binili namin sa Baby Expo and a couple more shopping bags for the lil’peanut so pawisan galore talaga. The Companion tried their Katsu Curry. Sorry but I don’t have the receipt with me already so I don’t know how much this one is. But the companion really liked it. Gave this one a try and I also love the curry sauce that goes with it. You can choose the level of spicy-ness of the curry though and companion opted for the light one. Pero nagsisis sya after. Sana daw pala mas maanghang yung pinili nya. Coz he loves spicy food. Ako naman natuwa na sa sauce. Just a tinge of hotness but not overpowering. While Sissy and I got their mixed Katsu set.